Recommended citation: Olmstead, Avery Oral History Interview, July 7, 2014 by Keith Ludden, Page #, Oral History and Folklife Research. Online: http:// www.oralhistoryandfolklife.org/wp-content/uploads/2014/11/Olmstead-transcript.pdf. Description: Avery Olmstead was born in 1971, and attended elementary school in Landstuhl, Germany, where his father was stationed in the U.S. military; and in New Brunswick, ME. He earned a degree in library science and works as a free lance library consultant. He serves also as a disability rights advocate. OLMSTEAD: I was born at a time when it was advocated that I go into an institution. Basically that was the norm at that time. NARR: Avery Olmstead was born with cerebral palsy. He uses a wheelchair and works part time as a free lance library consultant. When he was a small child, his father was in the military, stationed in Germany. His parents rejected all of the advice of professionals and the proposals for for institutionalization, insisting on a mainstream education for their son. OLMSTEAD. For which I’m really grateful, because if they had agreed to institutionalization, my life would have been completely different, and I don’t even know if I would be here right now. NARR: The school in Germany agreed to take Olmstead into its classes, but only if someone came with him–a task his mother took on. OLMSTEAD: Once I was in the school, people realized that I wasn’t an alien and didn’t have three heads, and I moved differently than everybody else did. I might look physically different and move physically different, but I was still a six-year-old boy and had a lot of the same wants and needs and desires as the other kids. NARR: In 1980 and 1981, after the family had moved to Brunswick, Maine, Olmstead served as an Easter Seals Poster Child. It was an experience he looks back on with mixed feelings. NARR: Olmstead says having a disability is part of his life, but it’s not all that he is. He gives a lot of credit to his teachers, and says elementary school was a mostly positive experience. OLMSTEAD: When you’re in elementary school it’s kind of cool, because, like kids would fight over who got to push me at recess and I would get out of class to go to physical therapy, which I actually kind of liked, because who doesn’t like a school break. I was involved in Special Olympics at the time and I got a lot of attention for it. I got a lot of attention for having a disability. NARR: But things began to change in junior high school. OLMSTEAD: It’s when people start to like, go off into groups and really find your identity, and I really didn’t know what mine was. It stopped being cool to have a disability (laughs) and the older I got the more I realized, okay, this is not–It’s going to be work. NARR: Olmstead says he withdrew a lot, and had to make a lot of adjustments. OLMSTEAD: I started getting glimpses into a reality that the fact that I was different from everybody else for other people was going to be a problem. OLMSTEAD: When I was growing up, I didn’t see adults that looked like me; that were in the community, like, having jobs, or married, or whatever. I didn’t see that, so I didn’t see a future for myself. I don’t think I ever actually articulated that, but I think that’s how I felt. NARR: He argued with his mother over going to college. She wanted him to go. He didn’t. Until he began taking inventory. OLMSTEAD: One day I sat down with a piece of paper, and I was like, “Okay, skills that I have right now.” I wrote that on a piece of paper–skills that I have right now. And I realized, well, I can talk a lot–people–I can talk, I can carry on a conversation. I was pretty good a people listening to me and talking to me and stuff. And I sat there and I sat there and I really couldn’t think of a second thing and I was like, “Okay, maybe she has a point. NARR: In 1990, Olmstead did enroll at the University of Maine-Farmington. It was the same year the Americans With Disabilities Act was signed into law, with a two-year ramp up period. He borrows a line from Dickens, calling it the best of times and the worst of times. OLMSTEAD: I learned so much about myself, but it was also the most painful journey that I think I’ve ever done. But again, I mean, I wouldn’t trade it. NARR: For the first couple of years, Olmstead just wanted to blend in, but one of the courses he remembers most in his final two years was–A dance course. After noticing that Olmstead attended many of the performances, the director of the company invited Olmstead to join them. OLMSTEAD: And I literally thought she was insane, because I was used to a world where there were things that I could do, and things that I couldn’t do. And a lot of that was a lot of people telling me that I couldn’t do stuff, and I believed it, because I was easier to believe it, than to go against them and try, because, again, I didn’t want to make waves. So it totally threw me off my game when this woman asked me to take her dance class. NARR: It took some convincing, but Olmstead finally agreed to take the class–and then he took it again. Olmstead graduated with a degree in rehabilitation services and a master’s degree in library and information science. For him and others, the ADA has opened doors, but not all doors. In fact, he says, the employment rate for persons with disabilities is four times lower than the general population. Even so, he calls the Americans With Disabilities Act the biggest victory of the disability rights movement. OLMSTEAD: Has it changed my life? Yes and no, I mean yes in that there’s an awareness that we exist and there’s an awareness that we count or should count. And there’s an awareness that we should matter, and I think that’s what passage of the ADA started for us. 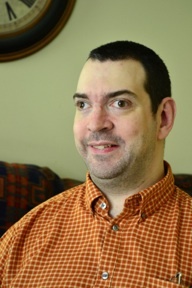 NARR: Olmstead spends part of his time as an advocate for disability rights. At the state level, he would like to see persons with disabilities get the services they need to live and thrive, and not have to choose between that and having a job. He would also like to see more work on physical access and more change in public attitude toward disability. He sometimes speaks to community groups on the topic of disability rights. It’s work he says he enjoys, but also finds frustrating. OLMSTEAD: I love it when I tell me story and I know that I’m heard, I know that people hear me. I’m not saying they have to agree, but they understand where I’m coming from, and that’s very powerful for me. What frustrates me about it is that sometimes I feel like as a movement, as a people, we’re still talking about the same things we were talking about twenty-five years ago. NARR: The Americans With Disabilities Act has made a different, but Olmstead knows it’s not the end of the struggle. OLMSTEAD: I Think the fact that we got the ADA passed is amazing and incredible. I think the ADA is great, but I think there’s a lot more we can do to build on that. I think the ADA is a great foundation, but you can’t just leave something as a foundation, you’ve got to build on top of that.